We are a leading Manufacturer of nandi slurry tanker from Ahmedabad, India. Nandi Slurry Tanker for Managing Biogas Slurry effectively and converting it into Natural Organic Fertilizer. Thoughtful design and superior build quality put the Hi-Spec range of Vacuum Tankers in a class of their own. A Vacuum Pump pumps the Slurry from Bio Gas Plant into the tanker. The Slurry Tank is transported to the Agriculture Fields where the same pump is used to spread slurry onto the fields. It nourishes the Agriculture Field with Natural Organic Fertilizer. 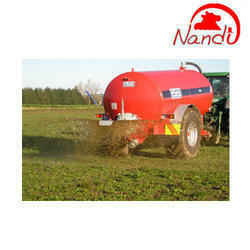 Looking for Nandi Slurry Tanker ?